Date Masamune, a.k.a Single Eye Dragon, is one of the most popular Daimyo in Sengoku period. He is known as the conquest of Tohoku Region, and established Sendai domain in current Miyagi prefecture. Because he lost his right eye, he is called "Single Eye Dragon." Childhood name is "Bontenmaru." He was born as the first son of Date Terumune, the ruler of Yonezawa. He succeeded the 17th load of Date clan when he was 18 years old. In 1581, he won the first battle, and later he kept fighting for the supremacy of Tohoku region. In 1589, he won the battle of Suriagehara, he conquered the land of Aizu. He ruled most of current Fukushima prefecture, southern Yamagata pref. and southern Miyagi pref. Other Daimyo of Tohoku submitted to Masamune. However, in 1590, Hideyoshi started the invasion of Kanto and defeating Hojo clan. Masamune obeyed Hidyoshi, but because he made a late decision to join the siege of Odawara, Hideyoshi took his new land of Aizu. However, his ambition never ended and he kept planing to invade many other land even Hideyoshi ordered no more private war between Daimyo. Therefore, he lost his land of Yonezawa and moved to Iwadesawa. His land was reduced from 720,000 koku to 580,000 koku. In 1593, he join to Korean War. When he was marching Kyoto, his out fit was so out standing to Kyoto people. Later, people started call "Date mono" for those who looks extremely out standing with clothing. After Hideyoshi passed away, he made a strong alliance with Tokugawa Ieyasu. He married his daughter to the son of Ieyasu. In 1600, the battle of Sekigahara occurred. He fought against Uesugi Kagekatsu. Ieyasu allowed him re-accuistion his ex-land of Aizu if he can win Kagekatsu. However, he couldn't win. In 1601, he moved to Sendai and built a castle and its castle town. In 1614, he joined the siege of Osaka. In summer, he defeated Goto, but beaten by Sanada Yukimura. After Sengoku period, he spent most of his effort for developing his own land, Sendai. He served 2nd and 3rd Tokugawa Shogun. He was highly trusted by 3rd Shogun Iemitsu. In 1636, died at Edo. He was 70 years old. His grave is located in Zuihouden. "曇りなき　心の月を　先だてて　浮世の闇を　照らしてぞ行く"
"My life was just like running in the darkness with only light of moon. I was just moving forward according with what I believe is right in Sengoku." Tsuruga Castle(鶴ヶ城), aka Wakamatsu Castle (若松城), is the main feature of Aizu-Wakamatsu. 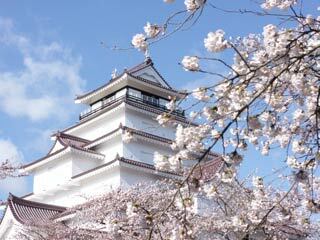 It is one of the 100 best Japanese castle and also known as Sakura spots. It was the one of the main place of the battle of Aizu in Boshin War. Therefore, historically it is very important castle. Many fans of Meiji Restoration and Shinsengumi, visit this castle. Recently, Kawara, the roof, were replaced in original red color, therefore, outlooks are almost the same as used to be during the end of Edo period. There is a parking. Park opens 24 ours and there is a light-up for the castle at night. Admission for Tenshukaku: 500 yen for adult. 150 yen for kids.